Designed to create twisted or spiralled extruded product. Examples include spiral dog chews & dental sticks. The belts can also create spiral coloured lines in plastic tube such as drinking straws & Hula Hoops rings. These haul-off/puller machines feature a pivoting belt design. This allows the top & bottom belts to be set at different angles to each other. This has the effect of creating a spiral in the extrusion as it is pulled away from the extruder. The belts can also be set in the conventional parallel mode for normal pulling. 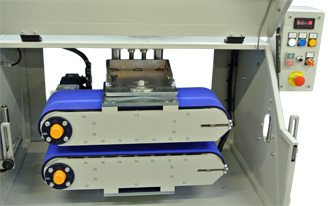 The Twister belt unit can be supplied as a stand-alone machine or attached to a Servo-Torq® rotary cutter. Drawing - Twister belt haul-off/puller (PDF).